How should bedwetting be addressed? How has Dry Night helped others? How do I use Dry Night? Bedwetting is common during the pre-school and junior school years and children vary in their ability to control their bladders at night time. It is quite normal for a child under the age of five to wet the bed occasionally and boys often take longer than girls to become dry at night. 'Accidents' do happen and should be dealt with kindly and sensitively in order to prevent emotional problems. Children who wet their beds should not be punished. There are many possible causes of nocturnal enuresis (commonly known as bedwetting), including medical problems, emotional and family problems and immature bladders. Your GP should be your first port of call if bedwetting is regular and persistent or if a child suddenly starts wetting the bed again. He/she will be able to examine your child and advise you of the appropriate steps to take. "Children have problems too! Many medicines for children contain additives, artificial colorants and preservatives. Some are addictive and others may cause side effects which end up being worse than the condition that they are supposed to treat. Parents are understandably concerned and may feel confused about what they can and can not give their children. As a Psychologist and as a parent, I have seen a need for safe, effective and healthy natural remedies especially formulated for children's health. Together with Native Remedies, I have spent a lot of time in researching and formulating a range of natural remedies especially for young children. All remedies are herbal or homeopathic and carefully chosen for maximum effect and maximum safety, to safely heal and solve your child's problem - naturally. While herbal remedies help to heal and promote health, homeopathic remedies work by strengthening the child's own body to heal itself. The remedies are non-addictive and presented in child-safe doses. No artificial colors or preservatives are used and manufacturing is in accordance with the highest pharmaceutical standards." If there are no underlying medical causes, regular use of Dry Night Bedwetting Formula can calm the anxious child and help to strengthen immature bladders. Dry Night has been especially formulated by a Clinical Psychologist in accordance with strict homeopathic standards to help your child to achieve bladder control at night time. Say goodbye to smelly mattresses and wet sheets in the morning and help your child to be more confident! "My 11 year old son did not want to sleep out because he was afraid he would wet his bed. I felt so sorry for him, but nothing we did made any difference. Your 'Dry Night' Formula has him dry for the first time in his life and he is so proud of himself! Thank you!" "This is a great product - we use it on my son. I can see the difference in his personality as he feels confident for the first time in a long while, being able to have a dry bed in the morning. Thank you so much..."
"My mother who turns 89 this year has been singing the praises of this product. I had to mail in and let you know. Keep up the good work!" Equisetum (6cH) - a remedy which comes from Asia and is widely used in Chinese medicine. Used homeopathically, Equisetum is a proven remedy which is especially useful for all bladder complaints and also helps to relieve anxiety. The homeopathic formula is safe and effective for children who wet their beds, often during nightmares and other dreams. Dry Night is developed with care by our practicing Clinical Psychologist, is 100% natural, safe, and manufactured according to the highest pharmaceutical standards. Individual ingredients are well-researched and have been put to the test over the years as a complement to the treatment of real people with real problems. Equisetum comes in pillule form with a pleasant tasting lactose base and is easily administered. Simply dissolve two tablets in a clean mouth twice daily. With regular use improvement should be noted within 3 - 5 weeks or sooner. 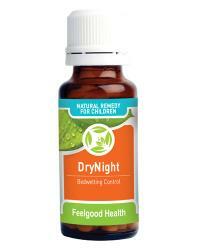 One bottle of Dry Night contains 125 pills and will last approximately 30 days.